Cottage by the Sea is a wonderful newly renovated and professionally decorated 1,433 square-foot oceanfront condominium that has three bedrooms and two full baths. It's located on the top floor of a five-story, 50 unit condominium complex with elevators and laundry room on each level. Welcome to our Cottage by the Sea! ~ Fully stocked updated kitchen with shiplap and open shelving featuring all new stainless steel appliances, microwave, disposal, coffee maker, blender, mixer and cookware. A pantry for storage and ample dishes for meals. Great views of ocean! ~ Open concept dining room and living room with completely updated furniture, decor and accessories with gorgeous views of the ocean as your relaxing on the brand new sofas! ~ Beach supply closet stocked with boogie boards, beach chairs, umberellas, a badminton set and more! ~ NEW Smart TV with Cable and CD player are provided in living room. Wi-Fi is FREE and available throughout the condo! Tv's with ROCU in bunk room and second king bedroom. ~ Private balcony with comply chairs and a lounger providing a panoramic view of the ocean. A perfect space shuttle launch viewing area. For your safety, a red lifeguard station is located (seasonally) on the beach directly in front of property. ~ The Master Suite offers a king size bed with fresh new mattresses and updated full bath. Enjoy beautiful sunrise and southerly views from the privacy of your own bedroom. ~ The second bedroom features two sets of bunk beds and a south-facing windowprovides full view of the pool and ocean. ~The third bedroom has King bed with Tempurpedic mattress with the lovely south facing view. ~ 60 miles from Orlando featuring Walt Disney World and many major attractions. We are so excited to have just bought the beach condo of our dreams! We are two families from Kentucky that were brought together by fate in 2014. We own a local furniture, home decor and design store in Richmond, Kentucky called Cottage on Main. We have always dreamt of owning a beach property so we decided to expand our business and share our little slice of heaven with you. COTTAGE BY THE SEA is decorated with our signature Cottage on Main style including brightly painted furniture and hand made pieces from our Farmhouse Collection. Check out our store at www.cottageonmain.net or www.facebook.com/cottageonmain to check out our style and some additional videoclips that give more details of our story. Divine intervention! We were staying in a friends condo in Port Orange and our girls quickly wanted to be closer to the ocean. We scrambled and found an available oceanfront and adorable condo in Hacienda Del Sol 1 and upon arrival FELL IN LOVE! We had the most relaxing vacation ever. The views are truly amazing. We loved the fact that we were steps from the sand and when we got hungry or tired, we would walk two minutes back into our condo to recharge. This small condominium complex is family friendly and the beach was never over crowded. We also appreciated that there were no cars on the beach and there is a lifeguard station right in front of our complex during peak season. Next thing you know we had called a realtor and were beginning the journey of owning our own slice of heaven. Our condo is such a sweet retreat for our two families and we really hope it is for your family as well. For us, this space allows us to disconnect with the hustle and bustle of daily life and focus on the simplicity of God's glorious creation and quality time with each other. There is nothing better than the peacefulness of sitting on the balcony and watching the sunset. It's truly tailored for families, good times, and lasting memories. The beach is just five floors away! Either sit and relax on your private balcony or take the elevator downstairs to enjoy a stroll along the mile wide pristine beach. Our unit sits on the top floor of a 5 story unit, directly looking at the water, with the sand a mere 10 feet from the property line. Washing machines are coin operated on every floor of the complex. Dryers are coin operated on every floor of the complex. Parking is available for one car per rental group. Inquire about off-site parking. Shuffleboard, Kiddie Pool, Gazebo with Air Conditioning for all guests to use that contains refrigerator/freezer, sink with countertop, tables and chairs, books, puzzles, games, etc. We really enjoyed staying here and the property is nice too. My kids really enjoyed the pool! The decor was really cute and everything was comfy and perfect for our family. Loved the condo, cute decor! The only thing missing was a washer and dryer in the unit. There is a laundry located on each floor for guest to use, otherwise everything was great! Cottage by the Sea is a beautiful, very spacious condo with super comfy beds. The condo was very clean and has spectacular views of the ocean. We enjoyed watching the dolphins and falling asleep to the sound of the ocean waves. This condo's location to the beach access is absolutely perfect and the entrance area into the unit is quiet and secluded. This is our fourth year staying in New Smyrna and love the area. The beach where the condo is located is very clean and not busy, we spent most days sitting in the sun. The condo provided beach chairs which is a definite plus for sure. The condo worked well for the week. This condo was perfect! The decor makes you feel right at home & it had EVERYTHING we needed. My family needed to all be together; we had my husband & I, our adult son & his girlfriend, our other two children, and my parents. This condo offered a beautiful space for all of us. We were able to stay up late laughing & able to wake up to watch the sunrise while all being in the same space. Way better then having to be in two separate hotel rooms. Shopping & restaurants are so close by, we couldn’t ask for anything more. We were able to cook here most meals as the kitchen had everything we needed. We are ready to book for our stay next year. Had a lovely week stay at Cottage by the Sea. This three bedroom condo RIGHT on the beach was fabulously decorated and welcoming. Two very comfy king size bedrooms and a third room with two sets of bunks easily fit our family of 6 plus my parents. The kitchen was modern and well-equipped. We cooked meals most nights including both Christmas Eve and Christmas dinners and had everything we needed to do so. Updated appliances and, most importantly, a wonderful coffee maker! TVs in all rooms and wifi access kept our four teens well-entertained as well as the heated pool which we all swam in. So warm for December! The living room had two spacious couches, two chairs and an abundance of comfy pillows. We couldn't have asked for better weather and spent every day either on the beach or doing some type of water activity. Christy has a well-stocked beach bin. Had everything we needed and plenty of linens for all 8 of us. Two bathrooms made it easy to access showers. The town of New Smyrna has everything you need with a general market in walking distance along with the best pizza parlor ever and two bfast restaurants. Oh, and we also enjoyed some local cuisine at Pappa's Drive-In Family Restaurant. So much food for so little! We played family poker on her round dining room table as well as had a gingerbread house making contest. We honestly couldn't have chosen a better destination for our family Fla adventure! Christy's condo had all that we needed. Thank you so much for sharing your home with us! 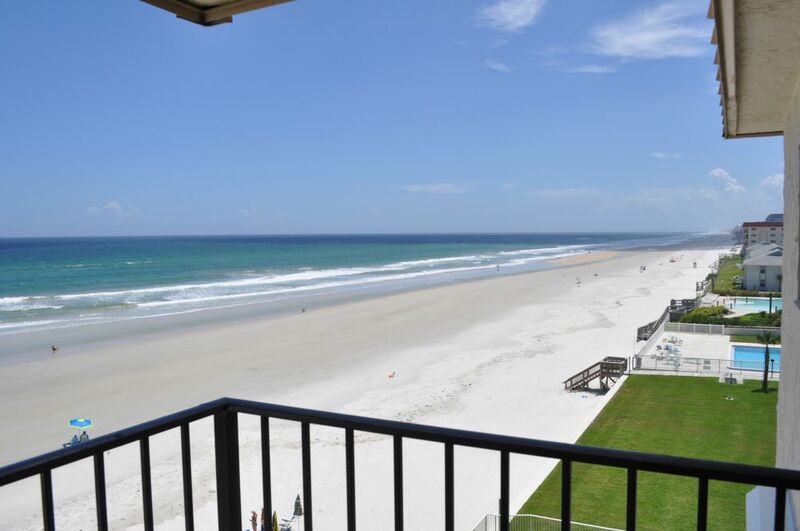 Stay at the beach but enjoy all Central Florida has to offer. From the parks at Disney/Universal, to Daytona Beach, Gatorland, Bok Tower, Winter Park and so much more! One of our family favorites is making your own pancake breakfast table side at the Old Sugar Mill at Deleon Springs State Park, Ponce DeLeon Lighthouse. Our standard rate is based on high season stays. Holiday weeks are $1875. Other weeks are discounted per the season/occupancy - please contact for discounts/rate reductions. We have a three night minimum on all rentals. Monthly stays are negotiable.